Our 125mm (5") gloss black flue pipe is 900 mm in length and is suited for gas or solid fuel stoves with temperatures up to 750 degrees C. This single-wall pipe is made of the highest quality heavy gauge steel and is intended for use as a connecting pipe for internal use only. The pipe is not meant to pass through any surface or used as a chimney liner. This pipe will show inside your home. The steel pipe and the coats of heat and acid resistant black gloss enamel measure 1.2 mm in thickness. The enamel coating covers both the inside and outside of the pipe, guaranteeing a high-quality paint finish that will last for years, and look phenomenal in any home. 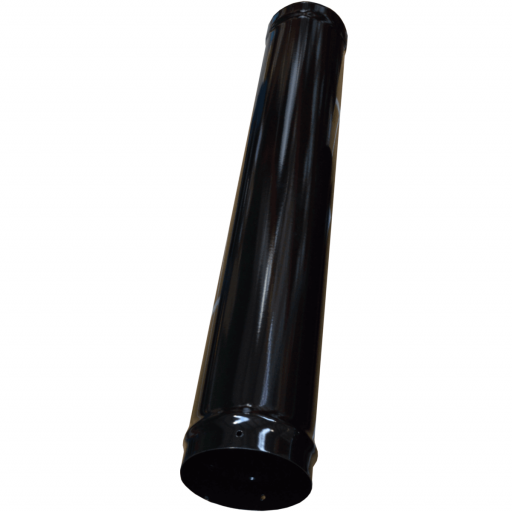 Our 125mm (5 inch) gloss black flue pipe is designed for easy installation. The male end of the pipe must be installed facing downwards for proper flue venting. The black gloss coating will flatter your room's decor and is made to match the finish on many stoves sold in the UK. Our 125mm (5 inch) gloss black flue pipe meets all requirements for safety when installing according to specifications. The pipe is available in different lengths so you can achieve a perfect fit on your internal stove flue system.